As any cat owner will know the logistics of your cat litter box in your house or apartment can be a problem. 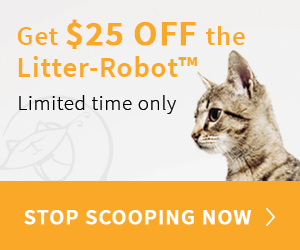 You face the age-old dilemma of where to keep your litter box in your home. Litter boxes by design aren't the most aesthetic item you can have in your house. This is where the EcoFlex litter loo comes in. What is the EcoFlex Litter Loo? Made by New Age Pet the EcoFlex litter loo is essentially a piece of cat furniture that houses a cat litter box. There are two main benefits to this product- it's designed to fit in with your existing furniture and works as a small end table. It also contains your litter box which helps with odour and also makes your home look less like a cattery! You're probably wondering where the name comes from and what makes this an "eco-friendly" product. It's made of EcoFlex (hence the name), a non-toxic material which is made from recycled plastic-wood polymer composite material. According to New Age Pet, this material won't crack, warp or split. I must admit I do like products that are eco-friendly but in some instances, this term is used quite "loosely" as a way to gain sales. I don't think this is the case with the EcoFlex litter loo as it's genuinely made from recycled materials. There are quite a few versions of cat furniture that contain litter boxes but there aren't many that can boost green eco-friendly credentials like the EcoFlex litter loo can. For that reason, I was looking forward to reviewing this product. Without further ado, lets look at the features. It's important to note that there are two different versions of the EcoFlex litter loo the standard version and the jumbo version. In this post, we are reviewing the jumbo version. The main differences between the two versions are the size with the jumbo version being considerably larger and having the ability to accommodate larger litter boxes and most automatic litter boxes. There's not a great deal of difference between the two models so I would be inclined to go with the jumbo version as it's better for larger cats and bigger litter boxes. Colours- The EcoFlex litter loo is available in 4 colours which are Antique White, Grey, Espresso Black and Russet Brown. If you're looking for a stylish piece of furniture that hides your litter box and makes your house look neater then the EcoFlex litter loo is ideal. Doubling as a small end table makes this very useful. I like the whole concept and idea and I think it works well. Whether or not you need this product will ultimately depend on your current set up in your home. I know some people (myself included) don't like having litter boxes in the living room. Although you could essentially have this product in any room I see its main benefit being in a living room or at least a utility room. The other thing to consider would be the size of your litter box, some users reported that it worked best with a high sided litter box. Looking at the sizes it will fit most self cleaning litter boxes but it certainly wouldn't fit something like the litter robot. If your cat is used to visiting a litter box that isn't covered then it may take a while for them to adapt to the EcoFlex as this is a fully covered unit. There are, of course, vents to let light into the enclosure so it isn't dark as such. Some users did report that the EcoFlex material wasn't the strongest but that wouldn't put me off as you're backed up with a 1-year warranty by New Age Pet. Overall a good product that has green credentials and is an interesting option compared to some of the other solutions on the market.